Did you attend Sat Nam Fest (Spirit Fest) this weekend? If so, welcome back! If this was your first time attending a yoga festival, I hope Sat Nam Fest exceeded your expectations and that the memories stay with you for life. Returning home, you may find you need an adjustment period from the festival atmosphere to your usual routine. As you transition back into your regular life, take special care of your body and mind, and try to nurture the connections you made at Sat Nam Fest. Take care of your voice. 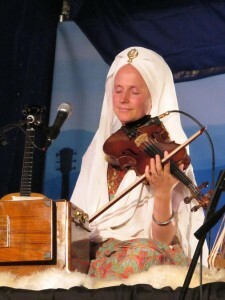 Spending several days in a row singing and chanting for hours is wonderful for the heart, but can be taxing on the voice. The combination of pushing our voices so we can hear ourselves over the music and putting all of our emotions into the words can lead to sore throats and cracking voices. If you came away with a frog in your throat, be gentle with yourself. Try gargling with warm salt water, drinking soothing herbal teas, or giving yourself a day or two of vocal rest if possible. You may not want to talk a lot anyway, instead spending more time listening to others and relishing in the good vibes Sat Nam Fest created. Spirit Voyage has a variety of delicious Hari Teas! Be gentle with your body. While many of us aspire to practice yoga extensively each day, sometimes that isn’t our current reality. 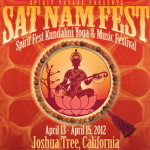 The daily yoga classes at Sat Nam Fest, and the pre-fest yoga intensive were wonderful opportunities to give daily yoga a try. However, if you aren’t accustomed to practicing yoga each day, you might be bringing home some muscular soreness in addition to cds and photos. Drink lots of water and feel free to soak in the tub. If you want to continue your yoga practice, go gently for a few days so your body can accustom itself to more frequent practice. Get plenty of rest. Did you stay up for Harnam’s set at 3AM Sunday morning? 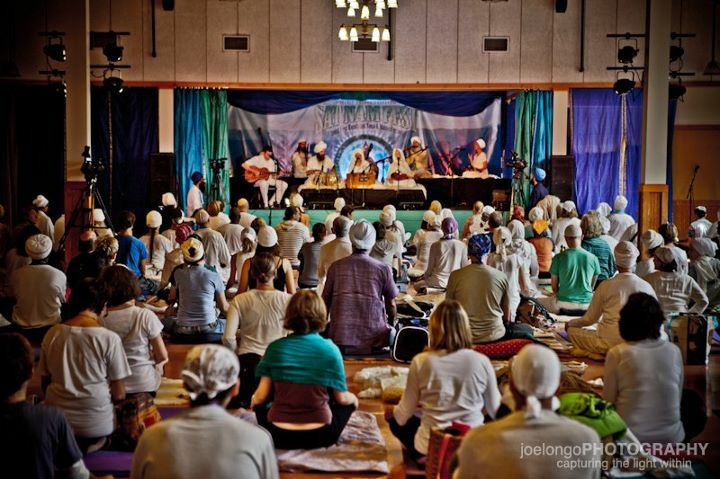 How about sharing in sadhana each day, starting at 4:30AM? The wonderful thing about Sat Nam Fest is something is always happening. But if you’re like me, you share the feeling that you have to try to experience everything a festival has to offer, even if it means skipping much needed rest. If you have the ability, spend a couple of days after Sat Nam Fest (Spirit Fest) taking it easy. If you want a nap, take one! If you feel like going to sleep at 10PM when you’re normally a night owl, go to bed! Think of each sleep as a sort of savasana after all of the yoga you did over the weekend and indulge. Couldn’t stay up until 3AM? 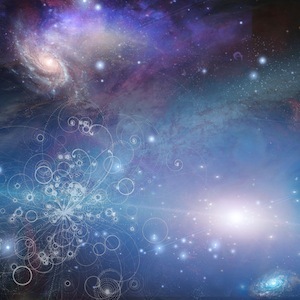 Check out Harnam Singh’s “Love Infinite Divine” on CD. Spirit Voyage has an abundance of Aquarian Sadhana albums to choose from! Keep in touch with new friends. One of my favorite things about yoga festivals is the wonderful people you meet. In day to day life, we may not always be surrounded by hundreds of people who share our love of Kundalini meditations or yoga music. When you’re missing Sat Nam Fest, it’s nice to be able to reach out to some of the people you met, whether by email or through social networking sites. You can reminisce, share pictures, and make plans to meet again next year. Come visit the Spirit Voyage facebook page if you haven’t already, it’s a great community resource! Take the experience with you. 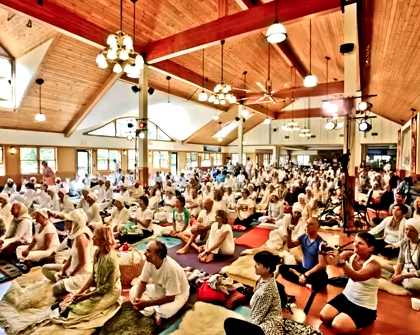 Spending 3 days chanting and doing yoga is wonderful, and it’s hard to leave. You may find yourself wishing you could stay in that festive and spiritual space year round, and never return to your regular life. But life calls, and we have to answer. If you find yourself getting frustrated at the crazy driver in front of you, or the person going through the express lane with more than 20 items, take a deep breath. Remember the feelings of love and patience you had while you were at Sat Nam Fest (Spirit Fest), and know that you can call on that any time you feel stressed or frustrated. 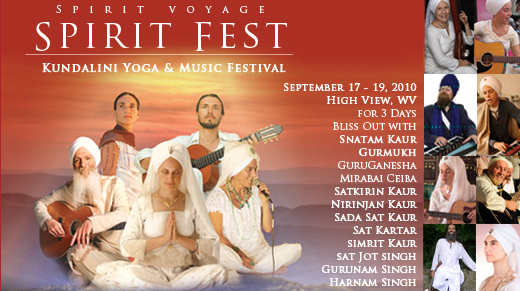 A Kundalini Yoga DVD with Snatam Kaur and Gurmukh filmed LIVE at the first Spirit Fest. A live CD recorded at Spirit Fest 2010. Spirit Fest Gets a Spiritual Name! Thanks for a wonderful weekend. You’re right, I need all five of these tips! I did love Harnam’s 3 am set (with surprise guest Kermit the Frog). The weekend was wonderfully uplifting. I’ve been doing the 2010 DVD and it has been carrying on the vibe. Thanks to Spirit Voyage for putting together this uplifting experience. It was just what I needed to rekindle the love with my sweet soul. I’ll be recommending this event to many others!